Alginate fibers are made from sodium alginate, a natural polymer extracted from brown seaweeds. Alginate fibers have excellent biocompatibility, biodegradability and high absorption capacity, and can be further processed into yarn, woven fabric, nonwoven fabric, knitted structure and many other types of functional materials. They can be used in the medical and healthcare industry, in particular, in the production of highly absorbing wound dressings. Alginate fibers can also be used in functional textiles and industrial textile products. Through ion exchange and polymer blending, alginate fibers can be made with enhanced antimicrobial, flame retardant and anti-radiation properties. On contact with sodium ions in the wound exudate, alginate fibers can absorb a large amount of fluid and form a moist environment on the wound surface, promoting the growth of cells and the healing of wound. 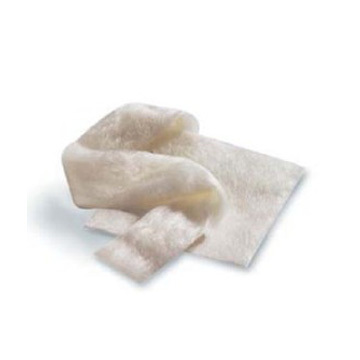 Alginate fibers are particularly suited for the production of wound dressings. They can be made into nonwoven fabric and slivers that are used for stopping bleeding, absorbing exudate and filling cavity during the wound healing process. Alginate fibers are highly flame retardant and can maintain their fibrous shape after burning, hence they can be used for the production of flame proof and flame retardant textiles. Because alginate is a natural polysaccharide with excellent biocompatibility for the human skin, alginate fibers are also suitable for the production of face masks. As a carrier material, many functional additives can be blended into alginate fibers, making them suitable for application in many areas of functional textiles and industrial textiles.